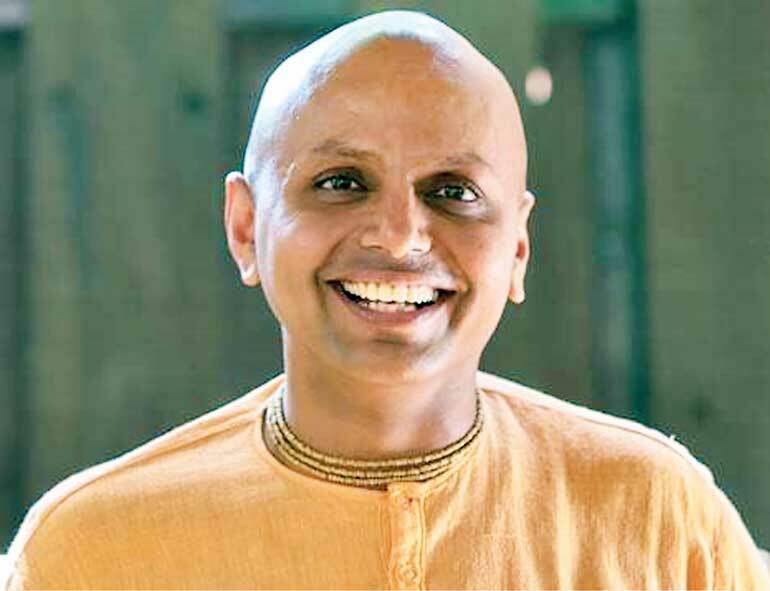 An Indian spiritual leader, lifestyle coach and motivational speaker, Gaur Gopal Das is here in Sri Lanka for the first time to conduct two sessions that are aimed at motivating and spiritually uplifting the local community. The first forum is to take place today 22 March from 10 a.m. to 4.00 p.m. at the Taj Samudra and will be focused on enabling the audience to strive for success that is meaningful, long lasting and full filling while the second will follow tomorrow from 8:30 a.m. to 10.a.m., highlighting the importance of adaptability, attitude and happiness within the corporate culture. Das was born in Maharashtra, India and went on to graduate as an electrical engineer, having studied at the College Of Engineering in Pune. However his passion for making a difference and helping people fix themselves in order to find inner peace drove him to become a lifestyle counsellor and motivational leader. Q: This is your first time in Sri Lanka, what are your plans and are you hoping to pay other visits in the years to come? A: Yes this is my absolute first visit to Sri Lanka and I’m really glad that I am here. I like the place very much and as soon as I arrived I felt nice. My plans are basically to conduct these workshops. I don’t think I have too much time in terms of exploring the country as I will be here for only two days. After the last part of my event I go back to India. I always run between events in different parts of the world. However I do look forward to coming back again and exploring more of Sri Lanka and the places of interests. Q: Could you give a background about yourself and why you chose this path as a motivational speaker? A:I studied electrical engineering and I graduated studying the particular subject. Afterwards I worked for Hewlett Packard (HP) in India and I was doing well in my work but there was a calling from within even from my childhood that grew stronger as I grew. I wanted to serve people and contribute to the lives of people in a different way. We all need to give back and we all need to add value. 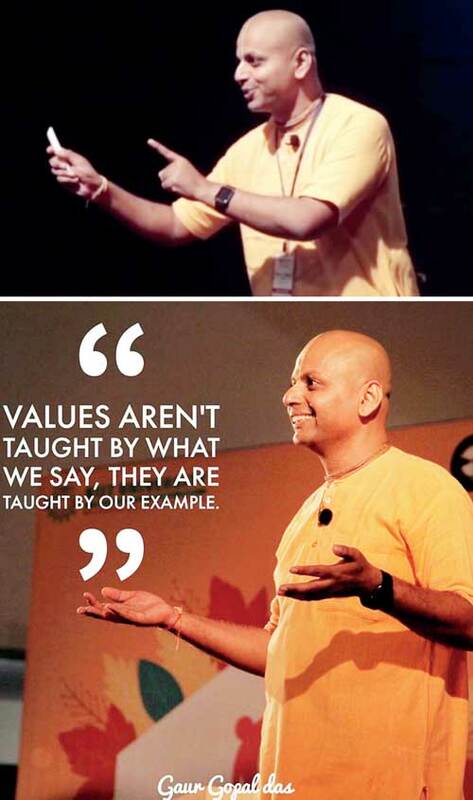 Even when we talk about organisations and companies it’s about adding value. Of course there is a money side to it. People are making money but while doing so we need to look at adding value, to the customers. I always felt that we as people need to contribute and give back. As an electrical engineer I would certainly be able to add value but I felt that there are millions of people doing the same thing. I felt that there are so many people fixing issues and problems of machines and I wanted to start fixing issues and problems of people. Engineering, the way we understandtoday is fixing problems of finance and machines but who fixes the people who run those machines and systems. Then I thought that I need to try and fix the people who fix the other problems in the world. This is why I thought of upgrading my career from being an electrical engineer to a lifestyle engineer. However there’s no such course in universities. I turned to be a monk at ISKCON which is where my spiritual foundation came from. You cannot help others unless you put your place right first. Today, I still work on myself through my spiritual practice. When you are working on yourself then you are in a position to help others and fix their problems. So that’s the beginning of my motivational speaking. You have information, you have knowledge and you have wisdom. Anybody can have information but when you distill that information down then that slowly turns into knowledge. When you further distill that knowledge down then that becomes wisdom which becomes an experience. What people look for today is not so much information but experience and realisation. Q: You emphasised on fixing people and the importance of helping those who have many troubles and issues themselves. How do you really fix a person? A: I think when we talk about fixing a person, we are talking about fixing the attitude of a person and fixing the inside of a person. I strongly believe that a nation is made of people, a family is made of people, a corporate organisation is made of people and a community is made of people. You can’t change any of this until you change people because people make these communities and nations. Fixing people is helping them understand their potential as to who they are and what they have inside. They get so busy with the routine life and get so carried away with the problems and issues that happen that they forget to take that inward journey and the path of self-discovery. Because they are not able to discover themselves they are not happy. They are just fitting into the mould that the world is creating for them but they are not happy. They probably even get a lot of money but they are not truly happy. Just because they are successful in terms of making money doesn’t make them happy. As much as they dress up well, I think it’s great that we help them facilitate their inner journey whether we make them a little reflective or make them look at their insecurities and potential to overcome these challenges. This needs a lot of interaction with individuals where you actually sit and talk to them. Q: What are your principles in life? A: My principles are that we are all here for a purpose. I don’t think any of us came here to pay taxes. Our birth in this world was not to pay bills and I don’t think that the purpose of life is just building an empire based on our wealth. That’s just one aspect of life. So the modern society makes one aspect, the aspect. Success in the world today is considered if you are wealthy and that’s a very miscalculated understanding of success. I do not think that that’s what we are here for. However that is an important aspect of life, we need money to have comfort but we cannot make that the be all and do all. It’s easy to make a buck but very difficult to make a difference in the world that we are in. I believe in one principle which is to try and make a difference as either an individual, a government, a corporate or as whoever we are. Let’s start making a difference to the nature, ecology and environment of the world. Nature has gifted us with so many resources and we are responsible for that. People today lead very irresponsible lives which is very selfish. One principle that I strongly believe in is let’s all, in whatever capacity we can, try making a difference even if it is small. Q: You give many motivational speeches, how do you get people engaged in your teachings? A: There’s a very popular proverb in English which says ‘minds are like parachutes, they function only when they are open’. A parachute functions only when it is open and so does a mind. So a challenge of every speaker is how to open the mind because once the audience’s mind is open, then the message slowly goes in. To engage the audience there’s three to four things that I prefer to do. Top on the list is humour. People love to laugh. Many times they love to laugh at themselves. Humourrelaxes people but of course humourshould never be condescending. Many times people joke but they do so to demine or criticise people. If everyone’s spirit is to uplift, then that joke is taken in a very sportive spirit. That’s the entertaining side of the talk. The second way to engage is to tell stories which are not necessarily funny but stories that are touching, stories that are meaningful and stories that are very pertinent to what they are going through in their lives. The third way I try to engage with the audience is by keeping my content relevant and contemporary because if you speak from the past and it’s not relevant to the people who are listening to you then they don’t feel engaged. Another thing that I do,is get them to stand up and do a little bit of exercise that will create a practical and interactive atmosphere. Q: Your program on 23 March is on secrets to success. In your opinion, what really are the secrets to success? A:When we are talking about success, there so many elements that people talk about. Someone will say to work hard, someone will say to be determined and never give up and so forth. If I were to sum all those words into one word, I would say that that one word which is the foundation for all other things which are true is attitude. If one has the right attitude then all these things can be adapted but if one doesn’t have the attitude to learn and work on yourself then it is impractical. When people talk about success, they talk about the net worth of a person in financial terms or about the position they hold in the industry or in society in terms of social status. What I feel is that all of these things seem to be like the tip of the iceberg but a large chunk of the iceberg is still underneath the water. When the Titanic sank it crashed onto an iceberg but what was seen on the top was hardly anything. What was underneath the water and unseen to anyone was a massive chunk. What people see is all just the top of the iceberg. What is underneath is the attitude. So to me success can come to one in whatever arena, or field of life only if one is willing to work on one’s inside attitudes. Q: You will also be conducting a happiness forum tomorrow. How do you create happiness within an organisation or work place? A: Like I said earlier, an organisation like a nation, like a community is built of people. People make an organisation. People make an organisation successful and people make an organisation a failure. People make an organisation a happy one and people make it a sad one. They are like antennas both transmitting and receiving. They are transmitting as in they are radiating an aura, an energy, positivity and happiness but they could also radiate negativity and depression. If you have 200 members you have 200 antennas and when these antennas together radiate positivity, then the organisation is a positive one. How we do we ensure that all these antennas are radiating positivity? It has a lot to do with the leadership and it has a lot to do with the ethos of the organisation. If people within the organisation are treated with dignity and respect then there is a family bonding that happens. They are no longer just colleagues but more than that. They are friends and even going a step forward they start feeling a sense of family bonding. Anybody who feels appreciated will end up doing way more than what he or she is expected of. I feel that organisational performances increase by happiness and happiness increases by how people are treated. Richard Branson said ‘you train people so well that they are now qualified enough to leave but treat people so well that they don’t want to leave.’ So happiness within the organisation is created by the people and people will create it only if they are treated rightly. Q: How do your teachings and workshops help employees of various organisations and institutions? A: All these teachings, workshops and keynotes give the people a sense of inspiration and motivation to work on themselves. It also creates a sense of empowerment because now they start taking the responsibility for their happiness to themselves. They are not passing the responsibility to someone else but do it themselves. When you have such responsible individuals then everything around starts flourishing and prospering. When I do these workshops and events I believe in making people feel that sense of empowerment. My talks are the investment but whether the investments turn into profit for their lives is based on whether they grow with it or not. For me to keep track of how they are following it up is not easy. There’s a lot to do with the responsibility that they take for their own lives, which is why I am very active on social media. They can still try and catch up on what I have to say. Likewise I do a Facebook live session everyThursday so people can ask me anything and I will answer their questions.